IRG was one of the endorsers of the 25 priority measures (25 mesures prioritaires) drafted by the 50 organisations that gathered together at the Villarceaux Meeting on the 13th and 14th of February 2017, organised by Les Jours Heureux. Because IRG shares in the observation of the urgency of democratic, ecological and social issues, and because IRG is convinced that collective action by the actors of public governance can contribute to a more just and sustainable society as long as roles, legitimacy and individual and collective responsibilities are well established, we wish to support the whole of these measuers as a shift in the public debate, towards actions in favor of democracy and re-founded institutions. 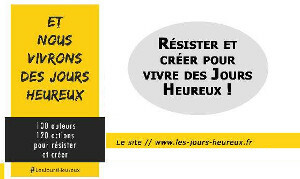 More information to be found on the website of Les Jours Heureux : http://les-jours-heureux.frThe opinions, endorsed by IRG, and published by the collective Les Jours Heureux can be read in Bastamag.